Happy 138th Birthday to Ashley Hall's founder, Miss McBee! Happy 138th Birthday to our founder, Miss McBee! In honor of Miss McBee’s 138th birthday, we wanted to share this incredible excerpt found in the 1949 annual titled: “History of Ashley Hall and Miss McBee” written by her niece, Corina “Nena” McBee ’49. “During the year of 1909, an ambitious young woman came to Charleston with an idea. The young woman was Miss Mary Vardrine McBee, and the idea was to start a school for young ladies. 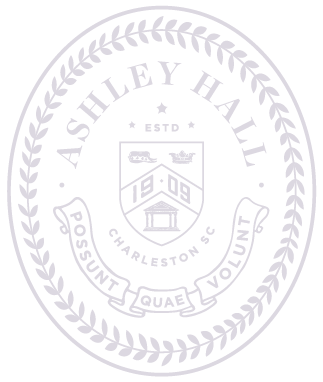 Miss McBee realized that the South lacked a school which gave the necessary college requirements to Southern girls, and so, on a day in late September, in the year 1909, Ashley Hall began. The idea was not new to Miss McBee. It had come to her several years earlier when she entered Smith College. A young girl from Fairmont, Tennessee, Miss McBee had been out of school for four years when she made application to take the college entrance examinations. For three long days she wrote away and passed all except two exams. In order to be admitted she had to make up one of these two. Immediately she sat down and took the algebra examination. And so it was that on a cold rainy Fall day in 1902, a joyful sub-Freshman, who had just passed her algebra entrance examination, picked up her heavy long skirts and hurried behind Dr. Brady, the Latin Professor, across the campus toward the administration building. She fixed her eyes on Dr. Brady’s old-fashion high boots and saw water fly out in every direction with each step he took. It was in this atmosphere created by the sight of the stern old gentleman wading through the water that the idea, the dream of Ashley Hall was born. Miss McBee was then, still, a very young lady but despite this she had the determination and strength of purpose to last her through four years of college and many hard years after that until her dream was completed. As we all know this dream culminated on a day in September of 1909 when forty-five students came to the old Witte house which has since become Ashley Hall and began the first day of school. The first enrolled day student was Josephine Pinckney and the first enrolled boarder was Pauline Sanders. These girls, this class of forty-five students, became the first members of a school which has grown and improved to become one of the outstanding preparatory schools in the country. The first year there were no graduates. But in 1911 three girls: Lucille Lebby, Katherine Paul and Ethel Thrower, were the first graduates, and in 1912 and industrious young student, Mary Howden, took the college entrance examinations and gained for Ashley Hall the prominence it needed to become a certified school. And so three years after its beginning Ashley Hall was well on its way to success. Of the school itself much can be said. The classes which at first could be held in the main building soon required new buildings that extended for a block. The students, originally forty-five girls, have increased to two hundred and forty young ladies. The teachers have been an impressive group of intelligent, thoughtful and if not famous, certainly well equipped ladies and gentlemen.